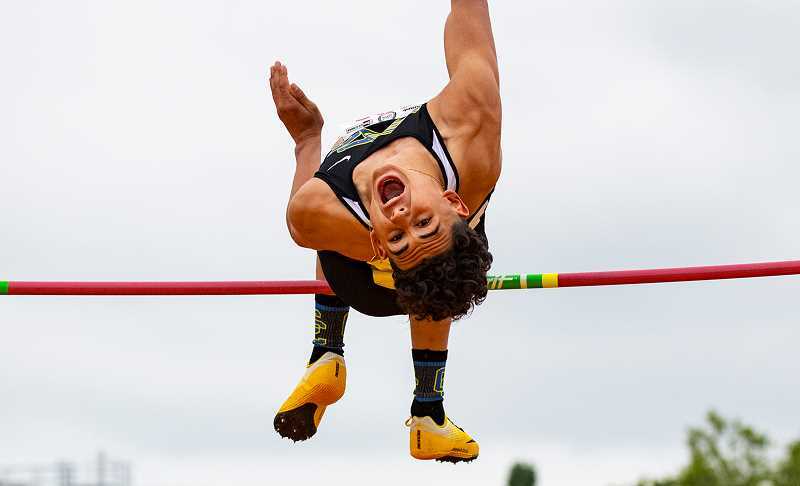 The Crook County Cowboys rolled to an easy victory at the Laker Classic Invitational Track Meet, which was held Friday evening in Lake Oswego. The Cowboys finished with 206 points, far ahead of second-place Lake Oswego, with 128 points. Rounding out the scoring in the boys meet were South Salem, 102.5, Southridge, 83.5, Reynolds, 76, and Gresham, 58. The Cowgirls did not have as successful a meet as the Cowboys, but still finished third in the six-team meet. Lake Oswego won the girls meet with 191 points. South Salem took second with 150 points. They were followed by Crook County, 121, Gresham, 76, Southridge, 51.5, and Reynolds, 44.5. "We came out on fire and in the rain and everything that was going on, our kids performed," said Crook County head coach Ernie Brooks. "Our boys almost won by 100 points and looking at it, just about everyone either had a PR or placed, which is crazy." The Cowboys took first in 10 of the 17 events contested at the meet, while the Cowgirls won just one individual event. Zach Guthrie continued a stellar sophomore season, taking first in the 100, 200, long jump and running a leg on the Cowboys' winning 4x400 meter relay team. Guthrie won the 100 with a time of 11.46, doubled back to take the 200 in a personal record time of 23.32, and leaped 20-11 to win the long jump. Teammate Dominic Langley, a senior, finished second in the long jump with the same distance. However, Guthrie won the tiebreaker with a longer second jump. Langley, Guthrie, freshman Triston Fischer and sophomore Alec Carne won the 4x400 by nearly eight seconds as they raced to a time of 3:33.79. Although he did not win an event, Langley still had an outstanding meet, especially considering that he has been ill.
Langley ran the 400 on Wednesday in Bend, then dropped out of his remaining events because of the illness. Brooks said that Langley has not eaten enough since then, but still did a great job of competing at Lake Oswego. "Dom is running sick," he said. "He's a kid that has put in the hard work the last three years, and it's coming. He is a special kid who works hard and does things right. He just hammers. I'm waiting for him to get healthy. That's the main thing." Langley placed second in the 400 with a time of 51.58, leaped 6-00 to place second in the high jump, in addition to his second-place finish in the long jump and leg of the long relay. The Cowboys' final win in a running event came in the 300 hurdles, where Carne won with a personal record time of 44.96. Teammate Elijah Becker was second with a time of 45.14. Carne ran his personal record time in the hurdles after a season best time in the 1,500, where he finished second in a time of 4:32.83. Carne was in contention the entire race, but was outkicked by Felipe Cordero Fraire of Reynolds, who won with a time of 4:31.29. The Cowboys absolutely dominated the field events. Senior Tyler Humeston won both the shot put and discus with throws of 48-09 and 126-08, respectively. Fellow senior Caleb Parrott was second in both events with throws of 41-09 and 126-05, respectively. "Humeston hit a lifetime PR in the shot, and Parrott had a season best," Brooks said. "Our throwers are just continuing to build. All of our guys showed up an competed." Fellow senior Jason Slawter got in the act, winning the javelin with a toss of 147-00. Noah Chaney, also a senior, won the pole vault with a clearance of 13-06, while Slawter finished sixth with a leap of 10-00. In the final field event, Eliab Rice and E.J. Allen finished third and fourth, respectively, in the triple jump with leaps of 38-07 and 37-01.25. Other placers on the track included Fischer in the 400 with a personal best time of 53.03, good for third in the event. Miles Chaney finished fifth in the 80-0 meter run with a personal best time of 2:08.51. In the 3,000, Cade Catterson and Alex Vail went two, four with times of 9:32.61 and 9:38.12, respectively, both personal record times. Not only did Becker have a good race in the 300 hurdles, he was also second in the high hurdles with a time of 17.46, while Trevyn Smith was fifth with a time of 18.22. Kaden Horton finished fifth behind Guthrie in the 200 with a time of 25.35. The Cowboy 4x100 relay team of Noah Chaney, Fisher, Horton and Slawter finished fifth with a time of 47.15 to earn the final points for the Cowboys on the day. In the girls meet, senior Faith Wagner took the Cowgirls' lone first with a leap of 10-00 in the pole vault. Sophomore Aubrey Love took second in the event with a clearance of 7-06. Kenna Woodward took second in the shot put and discus and added a fourth-place finish in the javelin. The junior had a season best throw of 36-09.50 in the shot, came back with a throw of 104-10 in the discus and tossed the spear 89-07. Teammate Marrisa Asher, also a junior, was third in the discus with a throw of 100-01, while fellow teammate Shelby Squire, a senior, was second in the javelin with a throw of 102-10. Other field event placers for the Cowgirls were Leahlynn Cates and Kendall Maycut in the high jump, finishing fifth and sixth with leaps of 4-04 and 4-02, Messina McClellan in the long jump with a leap of 13-09.5, and Sofia Langley, sixth in the triple jump with a leap of 29-07. On the track, Jan Carne had the highest finish for the Cowgirls with a second in the 1,500 in a time of 5:14.38. Kelcie Ames also had a strong meet on the track, finishing third in the 3,000 with a time of 12:51.81. Alyson Thomas placed fourth in the 400 with a time of 1:07.14, while Jenae Mapes was fourth in the high hurdles in 18.65. Messina McClellan and Emmah Barnes placed fifth and sixth in the 300 hurdles with times of 56.61 and 56.68. The Cowgirls also placed second in the 4x400 relay and fifth in the 4x100 relay. In the long relay, Tienna Quinn, Langley, Thomas and Carne ran a time of 4:30.08. Brooks noted that it was the team's best time of the year, but that the times should really drop once some individuals who have been injured are back on the team. Both the Cowboys and Cowgirls have been battling minor injuries, and although some of those individuals may not be back for a while yet, Brooks expects some of them to be able to run by this Saturday, helping the entire team. Langley, Quinn, Wagner and Messina McClellan ran a time of 55.85 for their fifth-place finish in the 4x400 relay. "Our marks weren't quite what you would expect on a sunny day," Brooks said of the meet. "But oh man, things are going to explode when we get some good weather. We just have to keep grinding and keep working and it will happen." Crook County competes in a three-way meet at Summit High School in Bend on Wednesday. In addition to Summit and Crook County, Ridgeview will also be there. Field events are scheduled to begin at 2:30 p.m. with running events beginning at 3:15 p.m.
Crook County then travels to Coos Bay for the Prefontaine Rotary Invitational, which will be held Saturday at North Bend High School. Field events start Saturday at 10 a.m. with running events set to begin at 11 a.m.
Brooks noted that with the Prefontaine meet so close after the meet at Summit, some Crook County runners will not compete in all of their events on Wednesday. "Coos Bay is the meet that we put on our calendar," Brooks said. "Our varsity crew will be taking sort of a back seat on Wednesday. Not a huge back seat, but we are going to dial it down a bit. Our 4x400 won't run on Wednesday, for example. Hopefully we will have some good weather and be ready to go for Coos Bay."